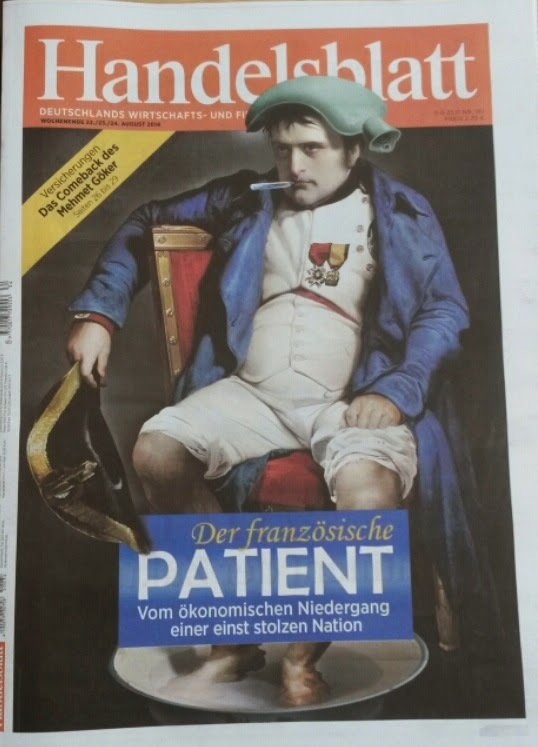 The front page of Germany financial daily Handelsblatt today depicts France as the sick man of Europe, warning that "a once proud nation faces economic decline." Of course warnings of French decline have been made before - notably the famous ticking baguette bomb on the front page of the Economist a couple of years ago - but it is striking that the German press is increasingly reflecting these concerns. "Our most important neighbour is mired in crisis. France risks falling behind when it comes to its budget, its labour market and its industry. However, the country could be successful if only it stops making itself smaller." The timing might be slightly ironic given that the French economy 'outperformed' the German economy in the last quarter - albeit by staying flat as Germany contracted by 0.2%. Handelsblatt has itself warned that Germany was "no longer a champion" but the German economy is still pretty robust, and should bounce back quickly, while France's problems are much more deeply entrenched. France is the sick man of the MananaZone and probably the country that will bring it down. I put this down to decades of public borrowing, a "what's yours is mine" attitude on behalf of the politicians and people and incompetent politicians that have promised their own people the same or even higher standards of living without having to work for it and without any economic reform. Can our politicians please tell us how the UK has anything in common with most parts of the MananaZone? They are going to refuse to reform anything or renegotiate any treaties so long as they can pass the risk and the cost of their monstrous bungling onto the people of the UK. France has, unfortunately, gotten exactly what is deserves. The report from the Nobel prize-winning economists yesterday summed this up well. France has a budget deficit of 3-4% of GDP, so it's more than easy to outperform Germany whose deficit is much lower. This shows the problem of the eurozone - countries with vastly different economies, politics etc. are forced to share a currency. The commenter above could be correct that France might bring the eurozone down. Just today, the prime minister had to reshuffle the government, removing the far-left from power. If the left wing of the Socialist Party were to defect, Hollande could lose his majority, and new elections would be forced. If the Front National were to win them, it could take power and withdraw France from the eurozone. That would make the continued existence of the single currency debatable at the very least. interesting fact that everyone who falls victim of the effects of steril, scientifically proven wrong economic theories must be considered a patient in needs of cure. two are the cases: or Germany is the only country in the whole world which is able to govern himself....or neoliberalism must be put aside and we can stop di run into the middle age. * The policies of the socialist government (Margaret Thatcher's comment that "sooner or later socialist governments run out of other people's money" cannot be repeated too often). * The inflexibility inflicted by the Euro upon France and the other Eurozone countries suffering financial problems. These two problems have the effect of a slow motion ship wreck and our glorious leaders in Brussels will not be able to fudge their way out of these continuing messes indefinitely. I hope the people of France and the leaders of the EUSSR have a change of heart in response to current events but that would not be true to form and so sadly, a disastrous wreck is likely to happen. The consequences will be dire and unpredictable and could well lead to the type of turmoil in Europe that the proponents of the EUSSR consider the organisation exists to prevent. Further to my first post, I understand that Russia banning EU good and services has hit the EU's agricultural sector very badly. The EU is now spending part of its budget to prop up agricultural prices. The UK's farmer's are, as a result, over-producing milk and cheese which now has to be stockpiled. The long-term impact of this is going to hit us permanently. We need jobs and growth - not more EU crap. France remains wedded to statism. Government largesse in bailing out troubled firms and supporting national champions has a history that long precedes Montebourg or Hollande. In this regard to blame French problems on the EU is to miss the point. The EU has until recently been a net provider of receipts to the French exchequer. Only in very recent years has this started to change through gradualist sifts in CAP pricing. More worryingly German automobile producers have wrested market share from Renault and PSA, sub-component manufacturing has switched to Slovakia and Poland, steel production is more profitable almost anywhere else. These issues can in some measure be addresssed as Hollande has already tentatively started to do, by aiding corporate sector competitiveness . Lower employee and balance sheet taxation balanced by reductions in state spending on the regions and pensions indicate that there is life and hope in France profonde yet. The real problem child in fiscal and monetary terms remains Matteo Renzi's Italy which promises much but delivers little. After the latest reshuffle stasis is not something that France can be accused of. How about sending the food exports which Russia has banned, to the Ukraine, Iraq, Gaza, and anywhere else that is short of food? Of course Putin doesn't mind if his own people suffer from food shortages, in a game of brinkmanship. I'm sure he has his own ample supplies, Of Western produced top quality food stuffs(Which Russia is unable to make for itself) to keep him in the manner to which he has become accustomed.